Amina, K., et al. 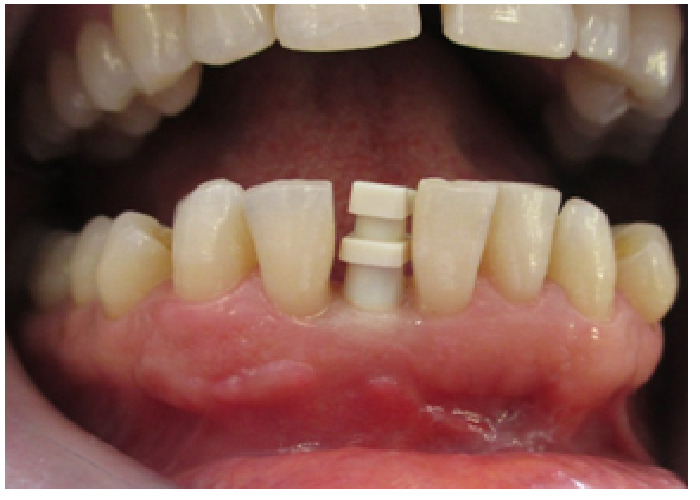 The Replacement of Missing Mandibular Incisor with Single-Crown Mini-Implant Restoration. (2016) J Dent Oral Care 2(1): 1-5. Copy rights: ©2016 Amina, K. This is an Open access article distributed under the terms of Creative Commons Attribution 4.0 International License. In cases of missing mandibular incisors, mini dental implants can be used to overcome limitations of bone volume that doesn’t allow the placement of standard-sized implants. 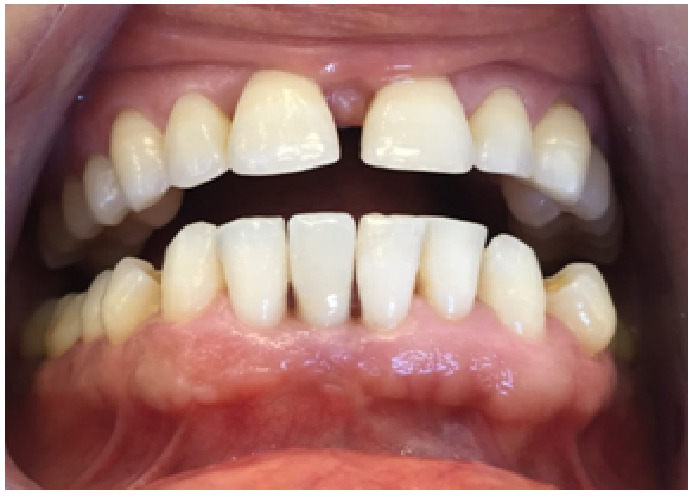 This article describes a 48 years old female patient who presented in the department of prosthodontics with a defective dental supported restoration of an unhealthy mandibular incisor which imposed its extraction. After clinical and radiographic study, the minimal bone volume could only accommodate the placement of a mini-dental implant to support a metal ceramic mandibular incisor. Dental implants are considered as a treatment of choice for replacement of all forms of tooth loss. Apart from providing function and esthetics similar to natural dentition, they also provide the most conservative treatment option. Their use to replace natural teeth has become commonplace in contemporary restorative and surgical dental practices throughout the world. Substantiation of their efficacy has been well documented in the dental literature. In fact, the use of conventional implants is suggested to allow favorable contact surface between the bone and the implant itself. Occasionally, lack of space does not allow to place implants of such dimensions. Standard-sized implant requires adequate bone width, and interdental space: they appear problematic in small space between the teeth where the implant was supposed to be placed, in areas in which bone resorption had occurred, and in cases where edentulous arches were with minimal bone in a facio-lingual or mesio-distal direction that could lead to augmentation and additional surgical procedures which can be used to overcome these problems. But, this can increase the duration of the treatment, morbidity, and mainly the cost of the treatment. It can also cause post-operative pain, and discomfort for the patient. The mini-dental implants (MDIs) can be used in many such cases to overcome these kinds of limitations. They are endosseous implants made of titanium alloy, and have diameter ranging from 1.8 to 3 mm with length ranging from 10 to 18 mm. They were introduced commercially to the dental profession in the 1999s[6,7]. MDIs were initially designed for the temporary stabilization of prosthesis during the healing period of conventional implants. However, research has suggested that the pull-out strength of endosseous implants may be based on the length rather than the diameter of the implant, and histologic analysis has shown that mini-implants under goosseo integration comparable to that of larger-diameter implants[1,3]. Recently, they have become popular in use for orthodontic anchorage, periodontal therapy, fixed prosthetics, and complete denture stabilization[7,8]. The best candidates have good general and oral health and gum tissues that are free of periodontal disease since the mini- implants are intimately connected with the gum tissues and underlying bone in the mouth, according to the American Dental Association (ADA). Suggested indications for use for MDI include patients with inadequate bone width; older or medically compromised patients who would benefit from the preservation of blood flow to the implant area as a result of the flapless insertion technique. MDIs are also indicated as the sole support of single-tooth replacements in the bone areas less than 6 mm in the facio-lingual orientation and 10 mm in a crestal-apical orientation. In situations where there is a missing tooth with small cervical diameter, in cases of reduced inter-radicular bone (convergence, or close proximity of adjacent tooth roots), and restricted inter-occlusal space, MDIs may be appropriate. They have also been shown to be viable alternative to bone augmentation when poor alveolar ridge width is encountered[2,9-11]. 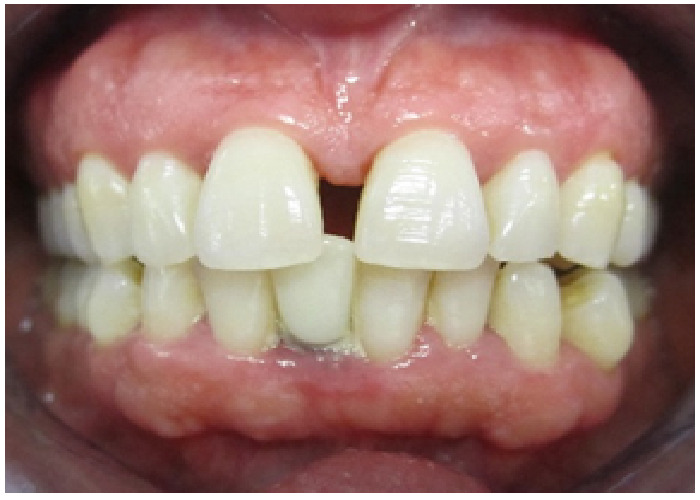 This often occurs in situations of congenitally missing teeth, thin posterior ridges that would require bone augmentation and in the mandibular incisors areas[2,3]. The average width of a mandibular central incisor is 5.3 mm at the height of contour and 3.5 mm cervically. This extremely small spacing creates several restorative challenges and limitations. Regardless of the type of abutment selected, it can be dif?cult to create a healthy emergence pro?le that mimics the adjacent natural teeth. 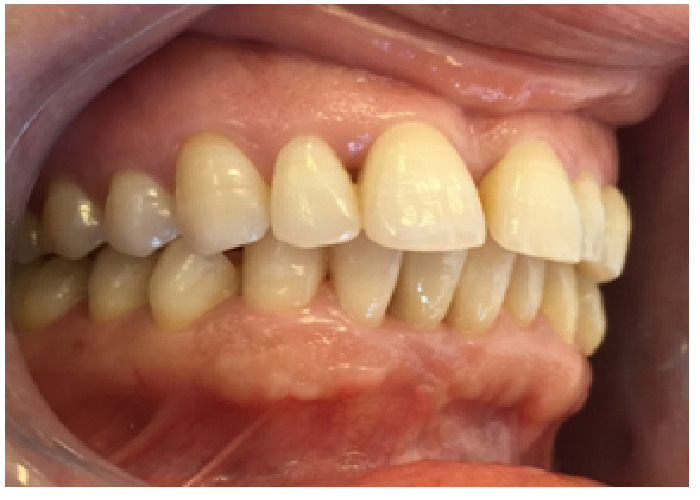 This article describes the replacement of missing mandibular incisor with MDI supporting metal ceramic single-crown, and highlights the advantages, and the success of this therapeutic modality. 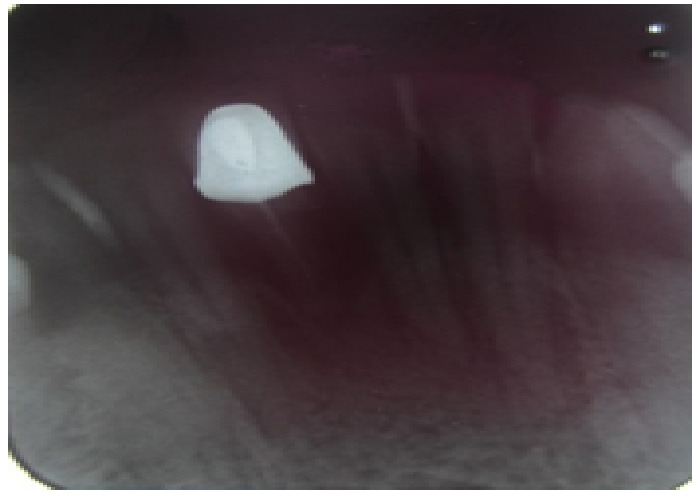 Figure 4: Photofraph showing the healing of the mucosa one week after the one piece MDI placement. Figure 6: Master impression after analog placement. Figure 8: Lateral view showing the alignment of the single-crown mini-implant restoration with adjacent teeth. If an implant site is inadequate, augmentation techniques can facilitate standard-sized implants placement in deficient ridges. Nevertheless, they have drawbacks such as prolonged treatment times, morbidity, and expense. MDI may be an appropriate alternative to conventional implants in the appropriate cases. Proposed advantages of their use include a less surgical time, and flapless procedure compared to normal implant, reduced bleeding, decreased post-operative discomfort, placement into narrow ridge, and immediate loading[2,9]. MDIs produce less osseous displacement, and may present less of a barrier for osseous healing and angiogenesis for osseointegration due to their small size. Histological evaluation showed that bone was in close adaptation to the MDI implant surfaces and vascular elements were apparent in the bone. The bone around the MDIs appeared to be healing, mature and well integrated into immediate function in the four to five month post-insertion period. Although the MDIs have a reduced surface area compared with standard-sized implants, histology has shown that the MDIs undergo osseointegration. Their ability to avoid flap surgery aids in healing as the periosteum is left undisturbed, and gingival healing is seen in 2 to 5 days. The healing period may be shorter than that for conventional implants[2,9]. MDIs are one piece without abutment micro gap and have much less physical displacement, which may be responsible for their long-term survival rate. This can simplify the restorative phase resulting in a reduced cost[2,6]. Raghani, et al. reported that radiographically, all the MDIs showed absence of interfacial radiolucency. Gingival inflammation and plaque formation was found to be less, and bleeding on probing was present at one implant site, which indicated that patients with single-tooth implant replacement exhibited good oral hygiene. On the other hand, Vigolo, et al. showed that cementation of implant restorations avoids anesthetic screw access openings, and problems related to the development of unstable and occlusal contacts. When replacing mandibular incisor, a limitation comes from the space requirements for the material used. 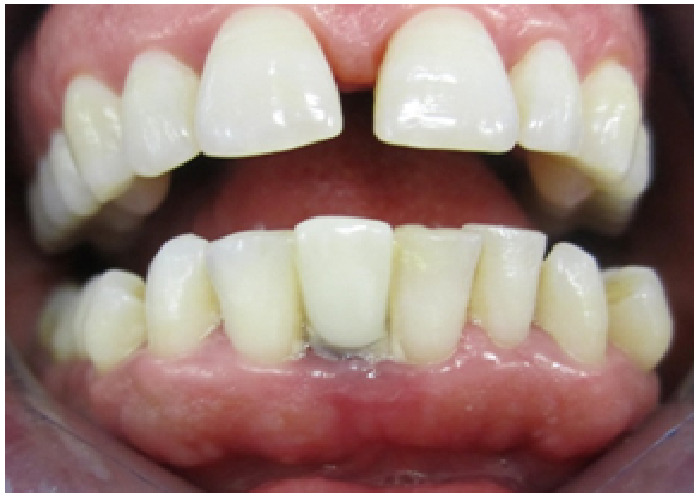 With such limited space available, adequate thickness for esthetic ceramic systems may not be possible. A cement-retained implant crown would require an additional 0.3 mm for the crown coping material, leaving only 0.6 mm for porcelain. The inadvertent result of inadequate room for these restorative materials is either a restoration that is over-contoured, and therefore unhealthy for the surrounding tissues, or one that is opaque and unaesthetic. Implant systems are available with differing dimensions; therefore, it is the restorative dentist’s responsibility to dictate implant sizes prior to placement and understand the implant system being used. Such tissue complications around MDIs were reported as moderate inflammation, edema, redness, and bleeding on probing. However, they were easily resolved with good oral hygiene instructions, and do not compromise osseointegration. Researchers reported that failed MDIs presented as being mobile or fractured may have beendue to placement in inadequate bone sites or use of implants of inadequate length. The clinicians must have knowledge of the osseous contour of the underlying bone because the implants require osseous support for proper osseo integration and long-term function. Without proper support, osseous dehiscences or fenestrations may result in an early or late failure under load. Computerized tomographic scans or ridge-mapping techniques can provide the clinician with contour information to ensure proper implant placement. Vigolo, et al. reported that the results achieved by the MDI rehabilitation were similar to those reported for standard single-tooth implant restoration. They concluded 94.2% survival rate of 52 MDIs for single tooth replacement in a retrospective 5-year study. Besides, Balaji, et al. focused on 2.4 diameter implant for single tooth restorations summarized a 90.9% success rate with satisfying results of the implants-mucosa interface. In addition, Degidi, et al. reported that anatomic locations, bone quality, esthetic considerations, and protective occlusal schemes are keys to ensure successful treatment outcomes. For that, suggested initial guidelines for MDI use must be respected by practitioners to ensure esthetic, functional, and mainly biological success: type I and II bone sites are most appropriate for MDIs, minimum of 1mm thickness of facial and lingual cortical bone, minimum space of 0.5 mm between MDI and the adjacent tooth, approximately 100 μm occlusal relief, and implant protective type of occlusal scheme for fixed prosthetics. Because of the flapless surgical technique most often utilized with mini implants, a surgical stent designed from preoperative dental models, x-rays, and/or cone beam CT scans provides for proper angulations in the bone to ensure closely parallel MDIs. So, that no preparation of the abutment will be required while having passive fit[2,7]. MDIs can be used successfully in a variety of clinical situations. Their advantages include less surgical time and postoperative pain, ability of direct loading after surgery with no harm to bone, and cost effectiveness. 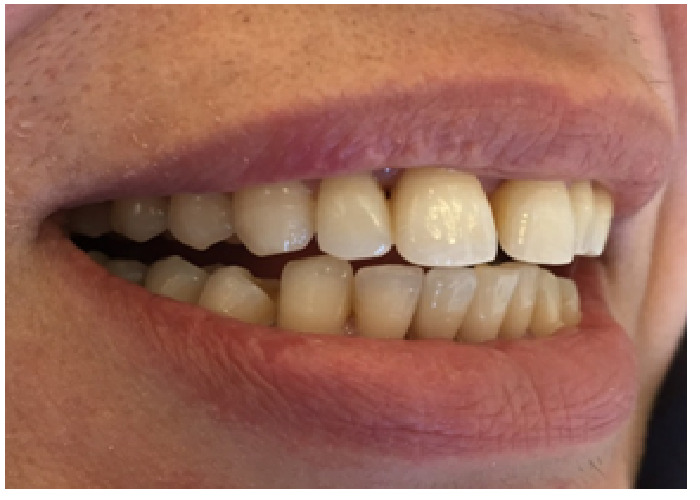 The single-tooth mini-implant restoration can be a valid alternative in many clinical situations in which space problems do not permit the use of standard-sized implants, and mainly for the replacement of a single missing mandibular incisor. MDIs show high survival rates, but special cautions for bone quality, and good oral hygiene should be maintained. We thank Mr Fethi Troudi for his valuable efforts that helped to manage a successful treatment. 1. Siddiqui, A.A., Mark, S., Mark, G. Use of mini implants for replacement and immediate loading of 2 single-tooth restorations: a clinical case report. (2006) Journal of Oral Implantology 32(2): 82-86. 2. Flanagan, D., Mascolo, A. 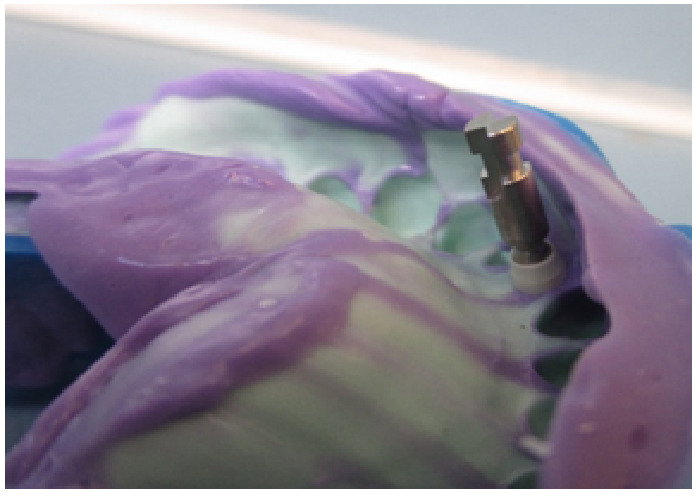 The mini dental implant in fixed and removable prosthetics: a review. (2011) Journal of Oral Implantology 37(1): 123-132. 3. Vigolo, P., Givani, A. Clinical evaluation of single-tooth mini-implant restorations: a five-year retrospective study. (2000) The Journal of prosthetic dentistry 84(1): 50-54. 4. Gleiznys, A., Skirbutis, G., Harb, A, et al. New approach towards mini dental implants and small-diameter implants: an option for long-term prostheses. (2012) Stomatologija 14(2): 39-45. 5. Balaji, A., Mohamed, J.B., Kathiresan, R. A pilot study of mini implants as a treatment option for prosthetic rehabilitation of ridges with sub-optimal bone volume. (2010)J Maxillofac Oral Surg9(4): 334-338. 6. Chopra, P., Chopra, P., Grover, H.S. Mini Dental Implants-The Same Day Implants. (2011) International Journal of Contemporary Dentistry 2(3). 7. Shatkin, T.E., Petrotto, C.A. Mini dental implants: a retrospective analysis of 5640 implants placed over a 12-year period. (2012) Compendium of continuing education in dentistry 33(8): 2-9. 8. Melsen, B. Overview Mini-implants: where are we? (2005) Journal of Clinical Orthodontics 39(9): 539-547. 9. Raghani, M., Sadhwani, B., Anchlia, S., et al. 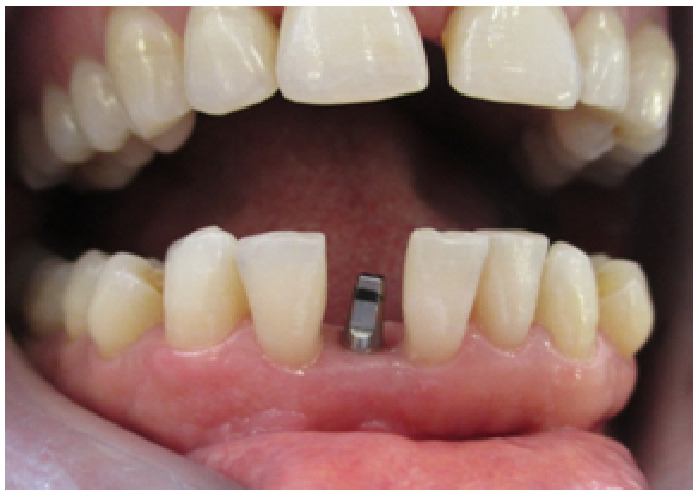 Mini-dental implants-for rehabilitation of narrow single tooth edentulous space: A clinical study of seven cases. (2013) Journal of Dental Implants 3(2): 125-133. 10. Fleigel, III J.D., Salmon, C.A., Piper,J.M., et al. Treatment options for the replacement of missing mandibular incisors. (2011) Journal of Prosthodontics 20(5): 414-420. 11. Christensen, G.J., Swift, E.J. Mini Implants: Good Or Bad For Long-Term Service? (2008) Journal of Esthetic and Restorative Dentistry 20(5): 343-348. 12. Vigolo, P., Mutinelli, S., Givani, A., et al. Cemented versus screw-retained implant-supported single-tooth crowns: a 10-year randomised controlled trial. (2012) Eur J Oral Implanto l5(4): 355-364. 13. Degidi, M., Piattelli, A., Carinci, F. Clinical outcome of narrow diameter implants: a retrospective study of 510 implants. (2008) Journal of Periodontology 79(1): 49-54.